Sherpa power!!!! Everest speed record broken by Pemba Dorji ! KATHMANDU, Nepal (CNN) -- A Nepalese Sherpa has broken the record for the fastest ascent of Mt. Everest, scaling the world's highest mountain in 8 hours and 10 minutes. Pemba Dorji Sherpa, 26, surpassed the previous record by more than two hours, reaching the summit at 2:10 a.m. local time on Friday (2015 GMT Thursday), officials said. The previous record of 10 hours and 46 minutes was set last year by fellow Sherpa, Lakpa Gheylu. Pemba and Lakpa had been competing against each other to chip away at the record. Pemba set a new record in May 2003 with a time of 12 hours and 43 minutes but Lakpa beat that effort three days later. Sherpas are native to the high altitude Himalayan mountains in Nepal and renowned for their mountaineering prowess. The ascention record has been getting shorter and shorter thanks to climbers being allowed to use ropes and ladders put in place by other climbing teams. Most climbers take two to three weeks to summit Mt. Everest because they must acclimatize to the lack of oxygen. Pemba's record is a far cry from the more than seven weeks it took Sir Edmund Hilary and his climbing partner, the late Tenzing Norgay Sherpa, to reach the summit from their base camp on May 29, 1953. Hillary and Tenzing had to forge their own route without the benefit of modern equipment to become the first men to stand at the top of the world. Re: Sherpa power!!!! Everest speed record broken by Pemba Dorji ! Does anyone know what the starting point for these speed ascents is? From basecamp? "the basecamp at 17,380 feet (5297 meters) elevation, and the summit is at 29,035 feet elevation (8850 meters), making for a total elevation gain of 11,655 vertical feet (3552 meters)." How many miles is it from basecamp to summit? Not in terms of the veritical feet. In terms of miles along the surface of the mountain. The following has never been mentioned in any of the press reports. It is very importanat. on the ground it's about 15-16 km, almost 10 miles. yes, I was also curious about how he would be able to prove it as few people will be on the summit at 2am, but some people must have seen him about 8100-8300m when he passed them. By the way I think an even greater accomplishment is the fact that this was his 2nd summit in 5 days. Who says you only have one summit chance? Only the rich untrained dudes and overpaid guides I guess.. Most of the covering media, such as the Explorersweb.com company (who runs Mounteverest.net, a website devoted to Mt Everest activities), when questioned about the validity of the record they reported on their news-websites, they believe and assume, as they stated in writing, that there is not an issue because "the whole world was watching." This does not show that they have a realty-based understanding of what actually occurs on Mt Everest. In the past two weeks ExplorersWeb has put a large amount of time and effort into the verification of Dan Howitt’s speed ascent/descent on Mt. Rainier this past fall, and his ascent record of Aconcagua this past winter. We have not been able to find any proof of Dans claims. After presenting Dan with a proposed news article including the results of the investigation, Dan requested in a mail today for his speed ascents of Aconcagua and Rainier to be considered unverified. George Martin, the CEO of the leading US covering media devoted specifically to Mt Everest climbing activities - Everestnews.com - stated in his article that he would inquire into the proof of Lhakpa's climb, including requesting the proof, but instead, in his follow up article, he deferred to the decision of the Nepal Tourism Ministry and did not follow through with his commitment to inquire into the matter as an independent US media company. I personally do not think that expeditions and speedclimbing should be mixed as it will cause unneeded dangers, but on the other hand it is great to see what humans are capable (?) of. Could someone explain me why the climb is done during the night. I thought it is more difficult. - the first part will be impossible to do quickly during the day as the first 60% of the climb is an oven and it will be too hot. These guys almost run up the mountain and generate a lot of heat. - you have enough time to get back down.. Regarding your comments above about www.mountainspeedclimbing.org (USA Mountain Speed Climbing). Indeed, Chad Kellogg's June 2003 Denali climb received a formidable dispute, and while mounteverest.net full covered his speed climb and spent months reporting that it was "official" (timed by basecamp managers Roderick and Westman), they never did a report about the dispute, etc. The dipute consisted of direct statements, written, from the reported timers saying that they did not in fact time him. And there's a 3 hour 15 minute discrepency with the time based on Roderick's recollection of when Kellogg started. The point is that mounteverest.net failed to cover this and in doing so has perpetuated a "record" that has been disputed in a good-faith and intelligent way, unlike other disputes, such as the 2003 Everest dispute between Pemba Dorji and Lhakpa Gelu which consisted of repeated allegations of "lying" and "cheating", as seen in the linked articles and audio-clip at www.mountainspeedclimbing.org. So it is important to comment on the media once in a while. I think the comments made at mountainspeedclimbing.org are appropriate and have a good purpose. Finally, you quoted an article from mounteverest.net about Dan Howitt. (Incidentally, Howitt simply stopped communicating with mounteverest.net about his Aconcagua and Rainier speed climbs due to their very unprofessional way of handling the matter which included a surprising kind of adolescent, emotional approach showing no respect for him whatsover but instead more interest in the fury of a dispute). Anyway, as well seen on his site, he has done very well to evolve into a successful speed climber. Yes he acknowledges that a couple 2002 and 1/2003 climbs didn't go well with the organization of the verification. But he was breaking new ground with time-verificatiion, and, importantly, learning. Essentially no one else in the world ever tries to get their speed climbs verified, but still, he decided to try it. It is a formidable challenge, getting your speed climb time-verified. Not many people know this, or can imagine the challenge, or the money involved in hiring third-party time-officials. Also, Howitt started climbing just months before these first speed climbs of his in 2002 and 1/2003. By the summer 2003 season, he showed that he learned much about organizing a thoroughly verified climb, and the need to use third-party official, and the money involved. I think, 7summits, that Howitt should be looked at as a person who has evolved a lot, and who, through his learning process, has broken new ground and shown what is involved and needed to have a speed climb thoroughly verified. Yes people make mistakes early in their careers, but when anyone tries something completely new, mistakes are bound to happen. What is important is how a person responds to those mistakes. Not only has he evolved into a sucessful speed climber, he has in a good-faith way, shown the real follies of the speed climbs of many distinguished speed climbers on some of the world's most difficult mountains. These are people with 20 times the experience and technical talent over him, and yet their speed climbing times are subject to very important, good-faith criticisms and rejections. All of this is done to improve the sport, which is his main intent. I think the situation in 2003 on Everest shows real clearly that third-party verification is necessary to bring in the needed certainty. Well, you seem to know Dan and his motivations quite well and you have mentioned his URL quite a few times now, so please share your connection with him. I agree with the above by the way; although as commented I am not fond of speedclimbing per se as it can endanger others as well as the climbers. It's just a matter of time until a great Sherpa kills himself in the process of getting famous, or some 12 year old freezes to death after getting HACE on (6962m high ) Aconcagua during a speedclimb. I do think that objective measurements are needed in order to verify claims. Yes, I do wonder how and if this will be done for the latest Everest record. Also, everybody makes mistakes, nothing wrong with that at all. I think Dan has found a nice niche in the internet mountaineering world and his site can be a great place to read about this specific subject, but the wording as quoted makes him look bad more than the media he is attacking in my view. I do not claim to know what is the truth here, I just know what caught my eye when reading his site and thought that it was a shame. There has indeed been a formal dispute placed against this year's Everest speed ascent done by Pemba Dorji Sherpa. My opinion: None of the 30+ world-wide news articles on the Everest speed ascent included any mention of who timed him, especially at the summit. (His start time at basecamp is not really an issue since he had a public send-off and his start time of day is well recorded and documented). Any record submission made by the speed climber and/or his supporters should include a submission of all of his proof for his time, or, a clear statement that the ascent was unverified and not timed. No such statements were ever provided, and no media, therefore, had anything to say about verification or lack of verification. KATMANDU, Nepal (AP) - A guide who once held the Mount Everest speed record is challenging a fellow Sherpa who claimed to have bested him by more than 2 hours in a recent sprint to the top of the world's tallest peak. A government committee plans to take two weeks to review Dorjee's climb and has asked both sides for proof to back their claims, Tourism Ministry official Shanker Pandey said Thursday. Sherpa guide Lakpa Gyelu said Pemba Dorjee, 26, could not have made it to the top on the day he purportedly broke the record because the weather was too poor. He said there were no witnesses that day and wants photographic evidence or other proof. ``The weather was so bad that day there is no way he could have made the climb,'' Gyelu said. The Tourism Ministry announced May 21 that Dorjee had set a new record with a climb of 8 hours, 10 minutes, based on reports from a government liaison at the base camp. Gyelu set the speed record last year by climbing Everest in 10 hours and 56 minutes, eclipsing the earlier best time of 12 hours and 45 minutes that had been set three days before - by Dorjee. Dorjee said jealousy was at the heart of the dispute. ``I have all the proof and followed all the mountaineering rules in achieving my record. They are just jealous and angry that I broke the old record,'' Dorjee said. 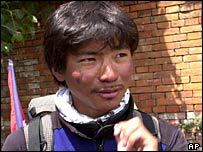 Dorjee said that once he reached the summit about 2 a.m., he radioed down and described objects that had been left there by another climber the day before. He said that the weather on the mountain on the day he climbed it was fine after 18,000 feet. The highest soap in the world! The Himalayan Times: "Sherpa's Doubt Pemba's Claim"
Sherpa climbers have cast doubts on Pemba Dorjee Sherpa's claim of having scaled the Everest in eight hours, 10 minutes. "We are ready to organise a rath yatra in his honour if he can prove he really climbed it in the time claimed," Kajee Sherpa said at a press conference today. Mountaineering instructor Pemba Gyalje Sherpa, who is also the treasurer of Nepal Mountaineering Instructor Association, said he could not believe it. He added many foreign climbers had also questioned the claim. They urged the government to set a mechanism to prove the records set, especially those regarding speed. Climbers have said none of the summiteers belonging to some dozen groups met Pemba there. Pemba also did not organise any press conference after his return. A release states that the American team Alpine Ascent International could not move ahead from the second camp due to bad weather but Pemba has claimed to have gone ahead. A Discovery Channel employee, Mike, added the weather was bad that day. Twelve Sherpa summiteers have demanded an investigation into Pemba's claim, and 15 others supported them. Shankar Prasad Pandey said a seven-member team has been formed to investigate Pemba's claim and present a report within 15 days. The Kathmandu Post Online: "Pemba's Everest Feat Draws Controversy"
KATHMANDU, May 31 - With Lakpa Gelu Sherpa’s formal complaint against Pemba Dorjee Sherpa’s Everest ascent in a record 8 hours 10 minutes as unjustified, the latter’s record set this May has come under controversy. "Looking into the facts, Pemba cannot make it to the top in the said time. And if he did, he has misreported the government officials regarding the timing of his ascent," claimed Lakpa Gelu. Lakpa was talking to The Kathmandu Post after filing a complaint at the Ministry of Culture, Tourism and Civil Aviation (MoCTCA) today asking the government to cancel Pemba’s record and re-instate his own.In his complaint letter filed at the Ministry, Lakpa has stated that there is an inconsistency between the time Pemba took to reach Camp 2 from Base Camp and the summit from Camp 2. "If we believe what Pemba has said then one can speed up his pace at higher altitudes," he said. "One who takes three hours to climb 1100 meters between Base Camp and Camp 2, cannot reach the summit, which is 2448 meters from Camp 2 in the next 5 hrs and 10 minutes," he claimed. The climate was also unfavourable, Lakpa said adding that an American expedition team – Alpine Ascent International – could not proceed from Camp 2 due to bad weather when Pemba is said to have reached the top.According to the claim, there was no one above the height of 6,500 meters on the 21st of May – the day when Pemba Dorjee is believed to have reached the top at record fastest time. Thus no one can say if Pemba really made it to the top or not.Pemba Dorjee, on the other hand, claims that he has submitted evidences regarding his ascent to the Ministry last week. "I have reported to my Liasion officer on time and have enough proof," he said adding he will produce himself anywhere if required. Ministry officials say they would look into the matter seriously. "We will consult the co-mountaineers and other expedition teams, look into the report of liaison officer before making any decisions," said Shanker Pandey, chief of the Tourism Industry Division at the Ministry. This is the straight second time that the two have put themselves into controversy. Last year when Lakpa Gelu broke the record of Pemba Dorjee after three days, Pemba had complained with similar arguments. The ministry however, decided in favor of Lakpa Gelu stating that the claims produced by Pemba was unjustifiable. Pemba had climbed Everest in 12 hours 45 minutes and three days later, Lakpa Gelu, completed the journey in 10 hours 56 minutes. World News > Kathmandu, Sep 17 : A year-long bitter feud between two ace Nepalese climbers as to who reached the top of Mt Everest fastest has been resolved for now with the government stepping in to adjudicate. Though the government said Pemba Dorji Sherpa was the fastest having climbed the 8,850 metre high peak in eight hours 10 minutes, rival mountaineer Lhakpa Gelu Sherpa is determined to best the record. With autumn expeditions having started to the highest peak in the world, it may be a matter of days for the dispute to open afresh. This May, a year after the golden jubilee celebration of the first conquest of the summit by New Zealander Sir Edmund Hillary and Tenzing Norgay Sherpa, 26-year-old Pemba who started his career as a porter for climbers in high altitudes, set his record for reaching the peak in the shortest time. Pemba's record is an astounding improvement on the time it had taken Hillary and Tenzing to reach the top from the base camp 51 years ago - seven weeks. The feat must have been especially sweet to Pemba since he bested the earlier record set by Lhakpa of 10 hours 56 minutes in 2003. Lhakpa's timing came within three days of Pemba setting a record in May 2003 of 12 hours 43 minutes. A subdued Pemba had been telling the world since then that he would yet best his rival and kept his word this May. However, Pemba's timing is doubted by Lhakpa who was at the base camp at the time. He said the weather had turned treacherous and was likely to hamper climbers. Pemba had started his climb with a Swiss mountaineer but reached the top alone. As proof that he had scaled the peak, he had brought back flags left by other expeditions before him. However, according to Lhakpa, they could have been collected during an earlier climb. The row became so widespread and acrimonious that veteran Everesters condemned it, saying it tarnished the image of a feat regarded as the symbol of heroism and endurance. A seven-member government committee set up to probe the claims of the two climbers announced this week that it was accepting Pemba as the fastest climber. A jubilant Pemba is already making plans for his next ascent. This time, he plans to create another record by staying on top for 24 hours. However, Lhakpa is not ready to throw in the towel yet. He too is planning to summit the peak next year and best Pemba's record. A total of 1,584 climbers have reached the Everest summit since 1953 with at least 185 climbers perishing on the icy slopes. But the peak continues to exert its pull on climbers and both Lhakpa and Pemba might find themselves outclassed some day. The Everest witness came to USA Mountain Speed Climbing out of fear of threats to his job, reputation, and family if he informed others of his observations of the climber Pemba Dorji being at Camp II over night (which is 1/5 of the way to the summit). Pemba was seen by him at 10pm and 12am, times he should have been on his way to the summit. The dispute filed months before the witness came foward, which was filed by Lhakpa Gelu Sherpa, showed that the last people to see Pemba were at Camp II. No one could go higher due to intense storms. Pemba hid in an obscure area of Camp II in the dark, as he started his climb only 1 hour before sunset from basecamp. Please see www.mountainspeedclimbing.org for the extensive reports on the Everest fraud. Note: we have not seen this witness of his testimony ourselves, but thought it interesting enough to share. Please contact USA Mountain Speed Climbing directly for any questions. The Everest controversy began in Nepal. The dispute facts were strong - most especially was the horrific weather above Camp II thwarting all climbing parties from advancing from Camp II. It was believed then, and later confirmed with an eye-witness, that Pemba Dorji DID NOT GO ABOVE CAMP II, and took advantage of (1) that he could hide in the dark of night, and (2) escape any witnesses above Camp II since there was no one above Camp II. Despite the strong disputes in Nepal, and the witness who came forward later to USA Mountain Speed Climbing, the record-claim continues to be covered and celebrated, most notably by everestnews.com. No one has looked into the witness matter, or took seriously the dispute in Nepal. Now with the Kilimanjaro dispute, and the 2003 Everest dispute (in addition to the 2004 Everest dispute), AND, the formadible disputes showing serious and concerning problems with Chad Kellogg's 2003 Denali speed climb proven fradulent time, and Chad Kellogg's 2004 Rainier climb proven fradulent time (he was witnessed starting at 4am, not 6am)....THERE IS MORE THAN ENOUGH REASON TO HAVE A INSTITUTIONAL REQUIREMENT FOR TIMING OFFICIALS. The press, etc, shouldn't cover any record, no matter who the climber is, if it is not officiated. Chad Kellogg tried to get his Denali climb officiated actually, but as clearly shown at www.mountainspeedclimbing.org with photo-copied emails from the basecamp managers, they did not time ANYTHING, and recall that he started at 11pm, NOT 2:15am as he told the press. Pemba Dorji, Kellogg, have received major press coverage despite what has gone on.